Literature and music have always been inextricably intertwined, though usually the comparisons focus on the links between poetry and lyricism. 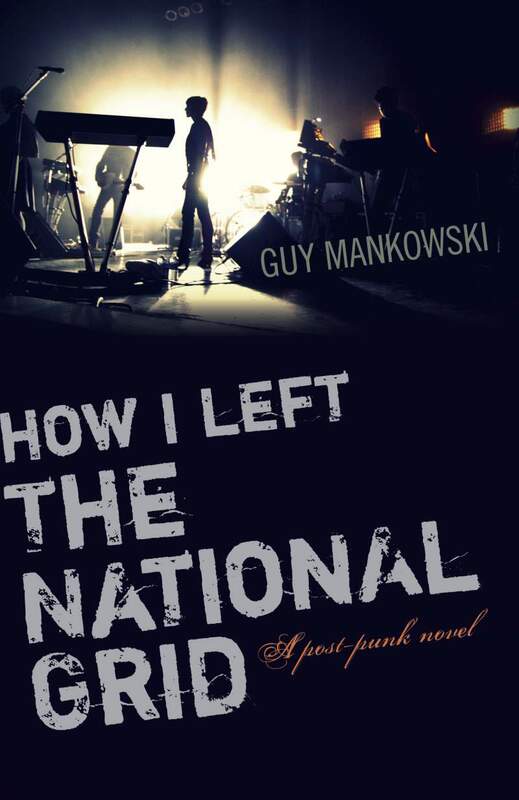 Newcastle-based author Guy Mankowski decided to go in a bit of a different direction, writing his third book How I Left The National Grid as a “post-punk novel”. Focusing on Robert Wardner, an anarchic rocker who essentially disappears after appearing on Top Of The Pops, it’s a novel that delves as much into the psychology of musicians as it does their experiences. The book launches at The Cluny, Newcastle on Saturday 28th February, with music from Hausfrau and Kingsley Chapman, former frontman of post-punk band The Chapman Family, who Mankowski says could have been the subconscious inspiration for his main character. Here, Mankowski and Chapman talk about the idea of post-punk, The Chapman Family and the novelisation of the musical experience. Guy Mankowski: When The Chapman Family were around it was a very dark time for the North. For the band in the novel I wanted them to somehow reflect that darkness. I always got a sense of that in your music, and wondered how intentional that was? Kingsley Chapman: I’ve always said that I think you need to be honest in what you write and where you come from. People should sing in their own voice, their own accent and sing about things they know. Music should be something that’s in your heart. My home is intensely important to me and it goes hand in hand with everything I’ve ever written. I wanted us to be the sound of run down steel mills and derelict shipyards populated by ghosts. Reading your book, I wondered whether you have a love of post-punk music, or just music in general? GM: There’s something about post-punk that captures my imagination. Post-punk inspires me because it turned ruin and decay into an art form. I wonder if Thatcher’s policies at the time, starving the North of funding, was a big part of that, and we saw that again with the recession when The Chapman Family were around. KC: The recession hit the North East more than any other part of the country. As a Labour heartland, it soon became apparent that we weren’t a top priority for David Cameron and the cuts hit our region more than most. On top of that we had the Queen’s Jubilee and the Olympics to contend with where seemingly the whole nation was ordered to celebrate and be joyous. There’s no finer portrayal of modern Britain than seeing a queue for a food bank as the Queen floats down the River Thames in a barge made from gold. What was more frustrating to me was that we all fell into line. Looking back I’m proud that The Chapman Family reacted in the way we did even if it did kill our career stone dead. GM: The Chapman Family came across very ‘post-punk’ to me. Having a DIY attitude towards making music, but at the same time putting across pretty insightful ideas. KC: I’m a firm believer that you should be influenced by every waking second of every waking hour. Every band I’ve ever seen, every article I’ve ever read, every book… It wasn’t a completely conscious move but the Manics influence was there from the start. When I read your book and I visualise the band, at least two of them look like members of the Manics. GM: The Manics have been a huge influence on my life. I’ve been asked before if my main character is based on one of their members and I always duck the question. Richey Edwards was such a brilliant artist, so I’m adverse to the idea of portraying him in a novel. The danger is I’ll reduce someone complex who wasn’t simply a member of a band I loved, but who had a whole other life that I don’t have a right to trespass into. I agree with what you say about being influenced by everything. In the opening scene of the book I have the singer do something onstage with a mic lead, on Top Of The Pops, which I seem to remember you doing from time to time when I’d come and see The Chapman Family live. But I didn’t think “I’m going to portray Kingsley in this novel.” Your band had just absorbed itself into my consciousness. KC: Were you ever in a band? Some of your descriptions of the feelings and anxieties (and egotism) of being on stage are unbelievably spot on – were these culled from personal experience? GM: Yeah, I was the singer in a band called Alba Nova for a couple of years and it’s interesting you mention anxiety. Like you, I learnt how to play by being in that band, so my memories of that band are being onstage and just trying to get a grip on it all. Being in a band is pretty similar to making a novel. You craft something in private and there’s a moment when the spotlight comes onto it and you learn pretty quickly if what you have just done will flourish or wither in the glare. Forming bands and writing novels seem to me two of the most ridiculous, exciting, defiant ways that a person can spend their time. I wouldn’t recommend it and I couldn’t live without it. How I Left The National Grid is published on 27th February by Roundfire. The launch event takes place at The Cluny, Newcastle on Saturday 28th February.